I usually write with fountain pens. But, I have very many of those, and would treasure either (or both). I love fountain pens! I prefer using them because they don’t require as much pressure, and so I can write for longer periods of time without cramps. I certainly prefer fountain pens, as I use them on a daily basis. At present, I use MBs, but have GvFC as well, and can recommend Lindauer in addition. 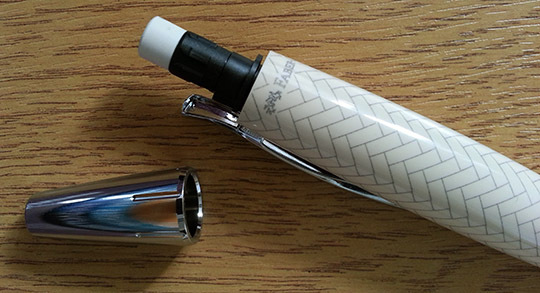 I tried the E-Motion fountain pen M nib in a shop once, liked it, but did not want to afford it at the time. Thanks very much indeed for your outstanding and always inspiring blog, by the way! These are both beautiful writing instruments! I would be very happy to win either one! I prefer fountain pens because the process of writing becomes more tactile and I love all the beautiful inks that can be used. They are also more comfortable to use, at least for me. 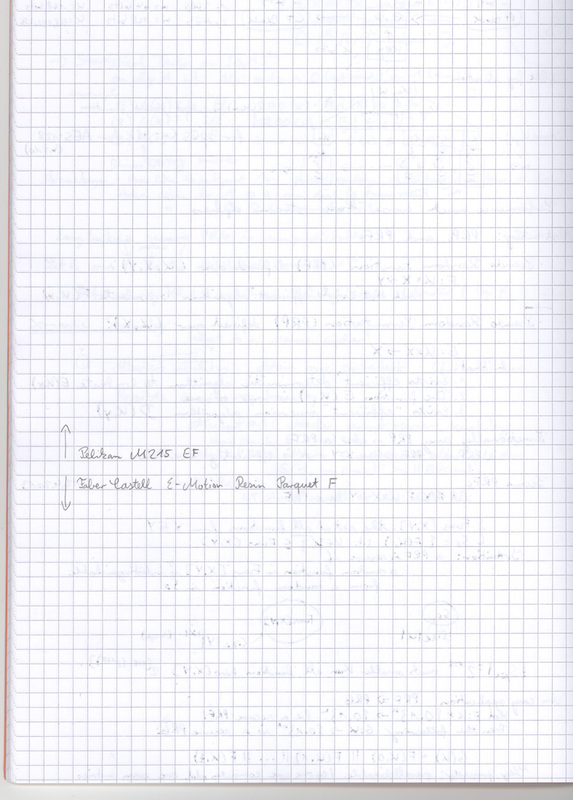 I also enyou mechanical pencils as they don’t need sharpening–and I never seem to have a sharpener when I need one. Thanks for sharing about these beauties! I’ve fairly recently caught the fountain pen bug again, having misguidedly tried going all electronic for a while. I love the look of these e-motion pens; I’ve got a Faber-Castell Ambition fountain pen with an EF nib and it’s absolutely my favourite. It’s beautiful to look at and to write with. What a beautiful set and a great review! My preferred writing instrument depends on the task at hand, the paper available, my mood, phases of the moon, etc. etc. etc. Ha. But most of the time my go-to writing instrument is either fountain pen or gel pen/rollerball. Fluidity of line and ease of writing is the main consideration — my hands are not getting any younger! I love using fountain pens. I loved the elegant look of fountain pens the first time I saw one, and I like that I get to use unusual colors in my pens. Nice informative reviews as usual Matthias! Since I alternate between sketching and quick notes, I tend to carry mechanical pencils or leadholders. Curiously never tried the 1.4 mm size. I’ve been going old school in man things in y life and have been having fun with fountain pens. They are so beautiful compared with ballpoints. Right now I’m lving Omas and Graf von Faber Castel fountains. I’ve been looking for a nice everyday pen end the E-Motion might be it. I love the E-motion line from Faber-Castell and I think the white is really special! A pencil to go with the fountain pen is a great set! Thanks for another nice review, Matthias. I use wooden pencils most frequently out of habit. I had been eyeing the E-Motion pencil for a while because of its twist mechanism, but can’t convince myself to put up with the 1.4mm lead. 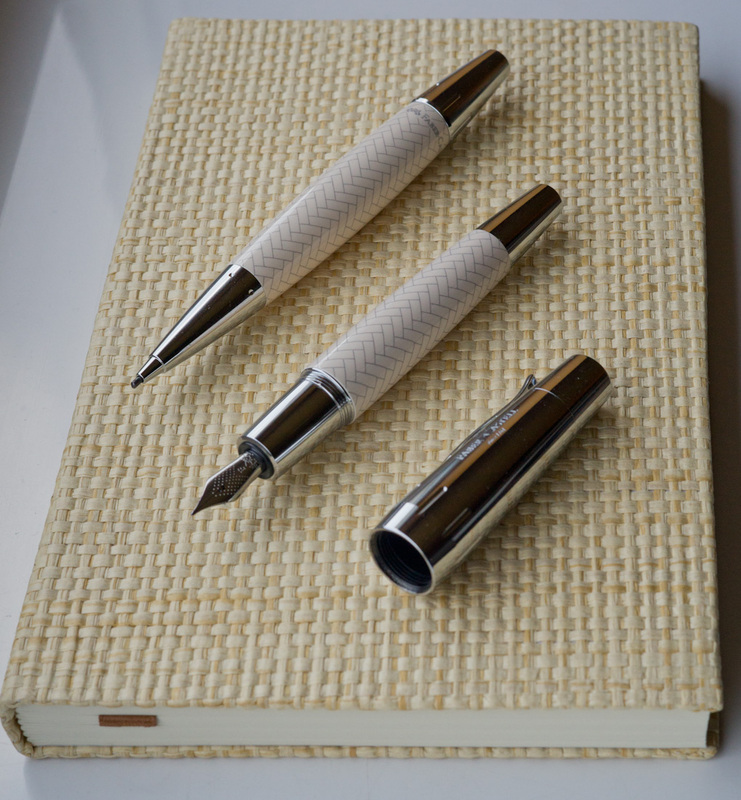 I don’t write with fountain pen enough to justify getting a second one, so I will pass on the giveaway opportunity. The Faber-Castell knights etching at the bottom of the nib is really neat. Hope you don’t mind me digressing and asking, is teNeues popular in the UK? I tried one teNeues hardcover notebook and liked it but couldn’t find it again in Toronto ever since 🙁 The one in the picture looks really nice. I have a soft spot for cloth covers. Might still work with a 1.4 mm lead if need be. Sleep-deprived nonsensical ramble aside: nice review. That journal also looks pretty nice. Will have to go do some googlin’…. I usually use a 4B CARAN d’ACHE Technograph pencil as I like the smooth way it writes, and I just like writing with pencils. The only problem I have with the Technograph is that it is coated with water based paint, so if you hold it too long, the paint starts to come off on your hand – a really bizarre paint choice for a pencil. Ian, my Ambition (with a B nib) dries out fairly quickly if I don’t use it for a week or so. Do you have the same problem with yours? Alberto, it might be a good size for very big sketches (A3 size), but that’s just a guess. Claire, I bought the notebook in HomeSense, which, I believe, is also in Canada (it belongs to the same group that also owns T.J. Maxx and HomeGoods in the USA). You never know what you find there, but what they have is usually discounted, sometimes heavily. There are some shops that sell teNeues in the UK as part of their regular product lineup. Paperchase used to sell teNeues, maybe they still do, but I normally don’t buy teNeues products full price as many of their stationery items don’t seem to be good vale for money for me (they will be for someone else who was just looking for something like that). Sean, thanks for the link. Oh, I like the FC products that are still available, but that are still using this logo. I wonder whether the sharpener would work easily with the 1.4mm leads or whether you’d really have to try hard to keep the lead centred. Barry, this comes as a surprise. My handwriting definitely got worse when I switched to ballpoint pens in the mid 90s, that’s why I switched back about 5 years ago. William, the Technograph pencils are very nice. I’ve only tried HB and B so far and should try others as well. I didn’t know water based paint will come off when you hold it too long. Does that also happen with the Castell 9000 when you hold it for a long time? I’ve always preferred fountain pen. The range of colours you can get with different inks is certainly one of the best parts. If you get bored of one colour, then you just swap to another. I also like how easily they write compared to a ballpoint pen (eugh). I write with pencils (mechanical pencils) all the time, I use ballpoints only when I need to do official things like signing a document. The pencil offers a lot of benefits. For example: it doesn’t matter how you hold it you still can write with it, you have a lot of options in line thickness from 0.35 up to 5-6 mm and various leads hardness. They offer a clean way to write, no ink stains, no bleed through the page, refilling them isn’t a dirty job, you can erase what you write, the leads don’t dry so you don’t have to check on them occasionally or put the cap on them every time you put them down after writing a quick note, memo, etc. On the not so good side: It’s hard to find colored leads for mechanical pencils. The pencil can’t be used for official documents. 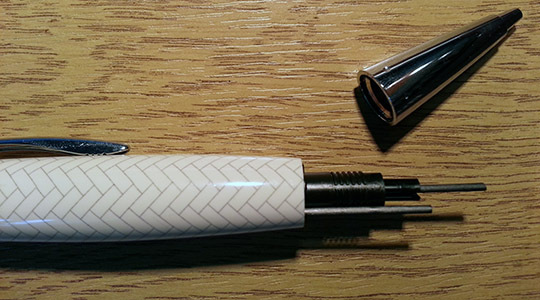 You have to propel the lead manually (there are automatic pencils that don’t require it) you don’t get this discomfort with pens or fountain pens. The dust from erasers is annoying. Now I have 6 mechanical pencils, which I constantly rotate for every day use. I have other mechanical pencils which I do not like this much or I don’t use them as often like a 2 mm clutch pencil. I stopped writing with fountain pens a long time ago, almost 20 years. After the first years of school when writing with a fountain pen was mandatory, I switched to ballpoints. I have a few nice fountain pens in beautiful cases but they don’t see the paper as often as they shod. I am a student and primarily write with pencils but I love fountain pens. 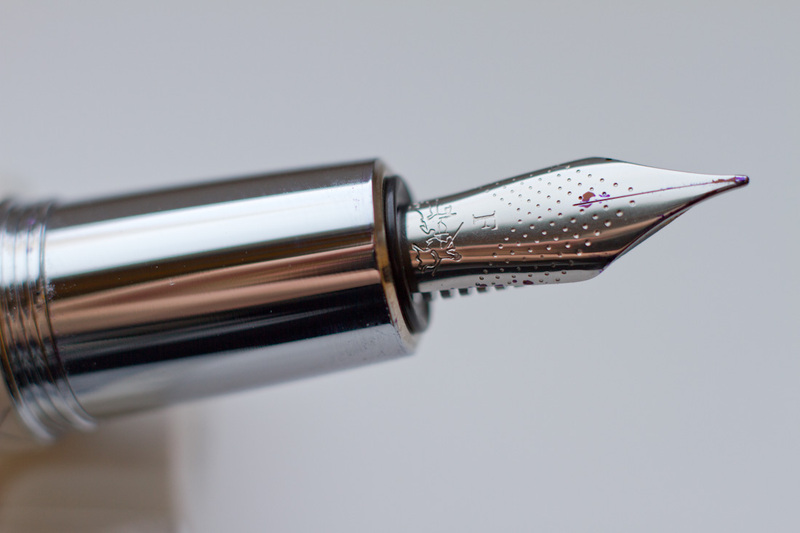 There’s a certain degree of elegance and grace associated with fountain pens that make them so appealing. They carry much more character and have the ability to transport me back in time. I love both fountain pens and pencils. They serve different needs and I use them for different tasks. Fountain pens are great because the range of inks that are available for them are superb, and I love experimenting with different types of inks. I also use mechanical pencils all the time for drawing and sketching, as well as for writing down equations and doing rough work. memm, I haven’t used a Castell 9000 I’m afraid so I can’t comment on their water based paint, but if you rub the pencil with a damp paper towel, does the paint come off on the towel? If it does, then it’ll probably do the same as the Technograph does. I do like to hold my pencils while I think, so when I’m writing I’m holding it all the time, sometimes hours at a time. Have not tried any of the higher-end/more expensive pens. My favorites are probably my Parker 51s (I have a couple of 51 Aerometrics — a Midnight Blue, and a Plum which I just got and haven’t even had a chance to flush out and a 51 Vac that arrived in the same mail as the Plum Aerometric), followed by a Noodler’s Konrad, and a Parker 45. Ohh a fountain pen <3. I usually use a fountain pen to take notes. My Noodler's Ahab with Heart of Darkness ink hasn't failed me yet :D. Pencils are usually reserved for exams and assignments. Well, I’ve dabbled with just about all types of writing/drawing instrument, but a new, freshly sharpened quality wooden pencil tops the lot…BUT my Lamy Safari fp’s filled with Lamy Blue come close. Thanks for the review! I also prefer fountain pens, since they are so comfortable to write with. My new favorite is a Delta Dolce Vita . . . . but I have not yet had the chance to try a Faber-Castell. Kaum zu glauben, deine Spendierlaune! Vielen Dank! That’s a very generous giveaway! I prefer fountain pens, for the variety in “feel” at the nib, and available ink colours, as well as the variety of designs. 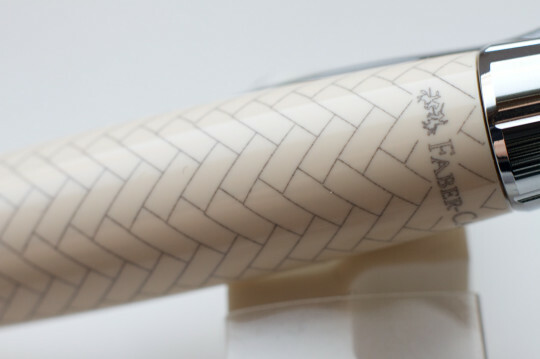 I have to say, the e-motion range had never really appealed to me (although I love my Faber-Castell Basic) until seeing this ivory colour – that’s very appealing indeed! Wow. That’s a very generous offer. I found this blog and this competition because I was researching Faber-Castell e-Motion pens with a view to purchase. 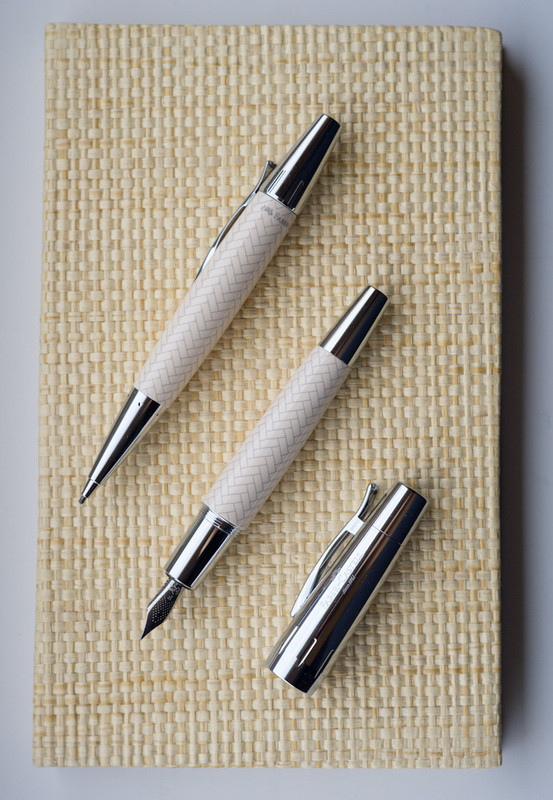 I love the unusual styling on these pens and the ivory resin barrel on this model is my favourite. They are under-rated pens in my view. I prefer Fountain Pens of course and have been on a crusade to influence everyone around me to do the same. My house has no traces of ball point pens anymore, and it is strictly prohibited lol! During architecture school I forced myself to use fountain pens (solely because I thought they looked cool) and continue to do so today, although it has its inconveniences, it is a real pleasure to go through the ritual of inking/pairing an ink to the pen depending on my mood and scenario in which the pen will be used. on the road. I enjoy the smooth feel they have on the paper and I notice that my penmanship becomes a little more ornate. I prefer bolder points because, for me, I seem to be able to vary my line and create a more interesting style. Those certainly look like beautiful writing implements. The winners have been determined this morning after I got the winning numbers from random.org today at 7:45 BST. I have emailed them and are waiting for their replies. If they don’t reply or if the don’t want the pens I will draw new numbers. Rares, your description of the pencil advantages is great, but one problem I do have with some pencils is that some smudge or that the graphite can transfer to previous sheet of paper if you write on the next sheet of paper. Regarding coloured leads, I agree. Good ones are difficult to find. Many break too easily. Regarding the durst from erasers, my favourite erasers are dust-free ones, not because of the wast that ends up in strands, but because they tend to eraser so well (at least the writing produced with the types of pencils and the kind of pressure I use when writing). I used the automatic Grip-Matic with coloured leads, but the automatic mechanism tends to break my coloured leads, so I only use coloured leads in non-automatic pencils these days. John the Monkey, I also thought so when I first saw the ivory colour, but it might look even nices if the tiles wheren’t laser etched but “moulded” into the body. I forgot to mention this part in the not so good section. My favorite eraser is Rotring B, it’s quite expensive and wears out quickly, but is damn good. My everyday eraser of choice is Rotring Tikky (Tikky20) price is just right and erases very well. There could be other cheap and good erasers out there (for example Stabilo, who has very nice erasers) but I just love rotring brand, plus I used their products for most of my life. My first good mechanical pencil was a Rotring Tikky II .5mm yellow which I received from my mother when I was in 7 th grade, if I remember correctly (I lost it in high school). I have to be honest and say Faber Castell are not so good compared to the competition (the cheap pencils). The Pentel Energizer cost me 2lei, that is 0.46 € according to Google. It was 3.5 times cheaper than the Grip Matic. And in my opinion is 3.5 times better than the Grip Matic. The only downside to it is the look and feel that you would receive from a pen, it’s a bit thick for my taste, but I learned to love it in a short time, 1 .. 2 pages. Also TK Fine has some build problems, the cap easily falls, and it’s not just my pencil, I know more people who lost the cap. My solution was bending the cap to fit better. The Rotring Tikky or Staedtler Mars Micro which are both cheaper pencils don’t have this kind of problem. Also the Mars Micro has a better tip retraction mechanism than TK Fine. Before I reply Rares – I have emailed Peter (third comment) regarding the giveaway, but haven’t heard back yet. I will email him again, if you read this message, please get in contact with me. If I haven’t heard in one week I’ll get another random number to determine a new winner. Rares, thanks for this detailed comment. Regarding the eraser strands, sometimes I move the paper over a bin and wipe them into the bin if there is one nearby. I don’t think I’ve tried the Tikky20 yet, but I’ll buy one if I see one – to try it out. The Tikky pencils are quite nice! I also just thought what a shame the red ring is only painted, instead of inserting a red plastic ring, then the red wouldn’t rub off over time. The Pentel pencil is really cheap! The TK Fine is nice, but the leads in my 0.3mm and 0.5mm TK Fines tend to break easily, which is annoying, especially with the 0.3mm where it happens often – especially if I retract the tip. Pingback: Just another pen ? !Blick über den Tellerrand vom 4. May 2013 » Just another pen ?! Just a quick update. Not long after my last comment Peter, the winner of the fountain pen, made contact with me, so both pens have a new home now. I hope they’ll arrive soon. Ah, thanks for that – I think my local pen shop is a Faber Castell stockist, so I’ll try to get along there and have a look at the pen “in the flesh”. Regarding Rares’ comment – I don’t think I’ve used the Energizer, but my experience of the Pentel P200 series was very positive – if they had retractable tips, they’d be better still 🙂 The Mars Micro I like, but the rubbery grips get a bit icky after a while, in my experience. With hindsight, I think I like a plain plastic, or metal grip on pens and pencils more, although I use woodcase pencils & leadholders (Koh-I-Noor 2mm & 5.6mm, Worther 3.12mm) far more these days.